We are rolling on the floor with much laughter. Me and the daughter. And then the missus brings in the plate of food. Ghee soaked stuff that can cause my nostrils to twitch from half a kilometer away and produce a ton of saliva that can be voluminous enough to cause the seas of the world to rise by a few meters. Today is no different. But shortly, I am told, rather curtly, that the food is for the daughter. Now the daughter and her eating habits are stuff that legends can take lessons from. Food is no fun for her and has no pangs about spitting whatever she has in her mouth, wherever she is, the moment a single taste bud raises a murmur of discontent. On an average it takes about two hours for the missus to feed her a meal. (If it is my turn to feed her, I would complete the job in twenty minutes. But three quarters of the food would be settling in some cozy corner on my hips. That story, for another time). This time around the missus has a master game plan. A new set of animals. I mean toys. 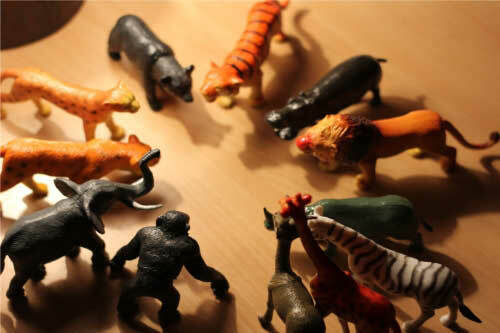 Small plastic toys. The plan was hatched the previous evening. Imagine a clutch of Generals discussing war strategy. It was almost similar to that. Like a wartime General hissing orders to a rookie Lieutenant. Of course, you know who the General is. She keeps it simple. As usual. Daddy’s duty is to weave stories around the animals and tell them nicely that would get the daughter to open her mouth in awe. Mommy’s is to look for such opportune moments and fill the little one’s mouth with food. So I keep trying. You know what Ray Owen said? He said, ‘Trying times are not the times to stop trying’. Ok? But in the meantime, this storytelling with toys is super exciting for me. I am so glad I have to focus only on that. The daughter is happy seeing the new set of animals. And I begin my story. About the lion. And the leopard. The elephant and the giraffe. In my story, the animals fly and land close to each other. Firmly sitting on my palms. The deer jumps. The lion sings. Sometimes they have a meeting or two too. The daughter’s eyes stay bright all through. She is engrossed in the story. Occasionally she emits a sound or two. Very soon, she is frequently exclaiming and laughing. Clapping. Jumping. The missus watches like a hawk from the sidelines. Finds opportune moments to tempt the daughter to swallow a smattering of food with so much ease that I wonder if this elaborate song and dance is required at all. But I am too engrossed in the story to even suggest something else. In some time the daughter soon gets up and sits amongst the animals. I make her a character in the story. The lion continues his song. The daughter dances. The deer claps. The elephant rambles. And so on. I realise that this is the most fascinating moment in my whole day. The insipidness of dealing with adults all day gives way to delightful curiosity and imagination that an adorable young mind comes with. The missus sits with glee in a corner. With a sly victorious grin on her lip. The kind of grin that small time chieftain sports, when he has conquered the Maharjah’s goat. The quota of food that the daughter had to eat is done. And more importantly her plan worked. So much so, that this becomes a routine. Every day dinner routine. Delightful for all of us. I endure the mornings of many days dealing with problems of creating ‘more value’ for adult minds, all the while looking forward to the renewal that would come my way when the animals walk out of their plastic packet and start flying around over dinner. A new story gets woven every evening. At our dinner time world, weird things continue to happen with gay abandon. The deer chases the lion. The giraffe is best friends with the zebra. The elephant can’t figure what it needs to do with its trunk. The rhino is everybody’s friend. The hippo can’t stop eating and the gorilla is the naughty one that jumps on the bed and sometimes onto the lion’s back. They all invariably end up going back into the big plastic box to have a good night’s sleep as one big family. The daughter reeks laughter and unbridled joy the moment she sees the packet full of animals. Mommy is happy that a plate of food goes in without fail, inspired by wide mouthed hippos, the tepid zebra and the tangy giraffe! Daddy is happy that he is able to weave such a world of delightful make believe. Someday, the daughter will switch on National Geographic and see a Lion tearing into the deer and the giraffe having no time for the zebra. Worse, she would see people who resemble her daddy kill and shoot them down. Her imaginary world will first crack and then crumble. When that day arrives, perhaps mommy will fret that an alternate plan needs to be drawn up for feeding the daughter. And daddy will sulk silly, about his wonderful daughter having a Buddha moment. Maybe he will try hard to reach the TV remote and change the channels. Anything for that pristine world of make believe existing for a bit longer. Even if that means for just a few minutes more only! But until the daughter comes to that point, all animals are equal and make one happy family that goes back into one giant plastic packet each night. Of course, some of them are more equal. But there is still time for that.